The 'aina (land) is not just soil, sand or dirt. The 'aina is a heart issue for Hawaiians. The very word 'aina brings forth deep emotion evolved from ancestral times when people lived in nature as an integral part of it. Mankind and nature were considered siblings born to the same parents at the beginning of time. The word 'aina literally means that which feeds, and maka 'ainana, a term for the common class of people, means "eyes of the land." Thus, nature feeds man and man watches over nature in return. The land gave the ancients everything they needednot just food, but clothing, housing, weapons, tools, musical instruments, canoeseverything they crafted, wore and ate came from plants, animals or fish. Dependent on nature, they revered and respected it. Success depended on living in harmony with nature. Woody Brown, a self described nature boy, speaks in SURFING FOR LIFE of his strong inclination toward cooperation instead of competition, a life choice that foreshadowed his warm embrace of Hawaiian tradition and culture as an adult. In Hawaiian tradition, cooperation comes largely from a notion of respect for one's own extended family ('ohana). And Hawaiians believe they have a genealogical connection as well as a spiritual connection to Mother Nature and all that she provides. For Hawaiians, the stars in the sky are the Mother, the sky is the Father, the Earth is the Grandmother, the Kalo (Taro) plant is the elder brother, and the Islands are the Aunties and Uncles. Hawaiians can trace their genealogy back to all things… the earth, sky, stars, and the Kalo. Thus, the connection between 'ohana (family) and the 'aina (land) is very strong. 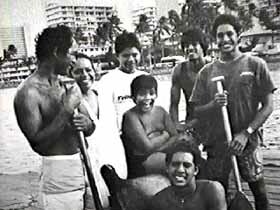 Depending on the canoe in which a Hawaiian's 'ohana arrived in Hawai'i, his or her genealogical belief system begins with Papahanaumoku (Earth Mother) and Wakea (Sky Father). With the union of Papa and Wakea comes the birth of the islands in the Hawaiian chain…beginning with Hawai'i and Maui. The third born was Ho'ohokukalani (to make stars in the sky). Soon after, Wakea and his daughter Ho'ohokukalani unite to create the islands of… O'ahu and Lana'i. Their union also creates Haloa Naka, a fetus born without life that is buried. In the place where the fetus is buried sprouts the first Kalo plant. Soon after, Haloa is born a strong and healthy man and becomes the first Hawaiian person. Papa and Wakea then re-unite and create the last of the Hawaiian island chain…Lana'i, Moloka'i, Kaho'olawe and Ni'ihau. Said of high chiefs whose lineage goes back to ancient times. This genealogy of Papa and Wakea is critical in forming the relationship between Hawaiians and the 'aina around them. 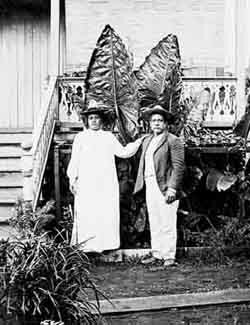 There is a saying in Hawaiian, I pa'a i ike kalo 'a'ole 'oe e puka or If it had ended with the Kalo you would no be here. The Kalo plant plays a vital part in the genealogy of the Hawaiian people as their most important crop and main sustenance. The term 'ohana comes from the Kalo plant itself. When one talks about the parts of the Kalo plant, the corm of the Kalo is called the Oha, the part of the plant used to feed one's 'ohana. Thus, Hawaiians are linked on several levels to the world around them  the sky, the earth, the plants and the sea. 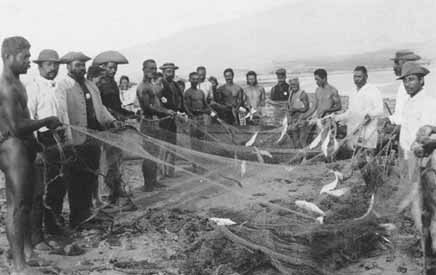 From this emotional and spiritual connection to nature, to all that's around them, Hawaiians invented the term Malama to take care of.. To Malama the 'aina or kai (sea), to take care of the land and the sea, to protect and conserve the environment, is directly linked to protecting and conserving the 'ohana and all people of good will. When Woody Brown arrived in Hawai'i in 1940 (as told in SURFING FOR LIFE), he was recovering from the devastating death of his wife during childbirth. As he traveled throughout the islands, he experienced overwhelming warmth, generosity and hospitality from the native Hawaiian people he met. This is the famous aloha spirit that the world has come to identify with Hawai'i, and it was Woody's salvation. 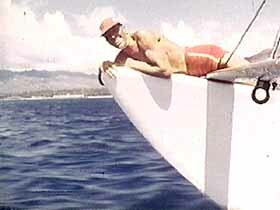 Herb Kane, artist, writer and co-founder of the Polynesian Voyaging Society, defines aloha the following way: An unquestioning friendship and desire to share, developed within the 'ohana but extended to all persons of good will, aloha has been variously defined as affection, compassion, mercy, sympathy, civility, kindness and charity. It is given without restraint or ulterior motive, and it is expressed with a geniality which springs from one who is secure in his society and his environment. The aloha spirit is a friendliness, a caring, a willingness to be helpful, most often expressed as the hospitality (Ho'okipa) that Woody experienced over 60 years ago. 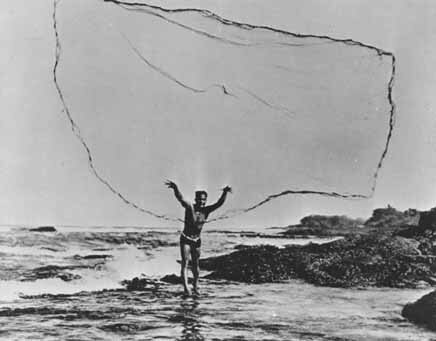 Love and caring for the land is aloha 'aina and the same attitude toward the sea is aloha kai. These ideas illustrate the love and respect that Hawaiians have for the world around them, the same love, affection and respect they feel for their 'ohana and all people of good will. 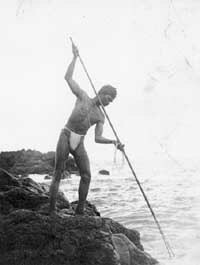 There were kapu (taboos) set on what one could take from the land and from the sea; conservation was practiced in fishing as well as hunting and gathering of wild plants. 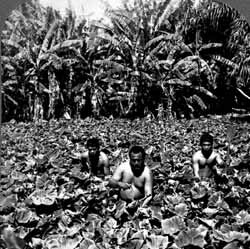 Hawaiians took only what they needed from their environment and that respect enabled them to have some of the most productive agriculture and aquaculture throughout the Pacific. Especially relevant to SURFING FOR LIFE is that the most fundamental element in island cultures is water. In fact, although there was no concept of monetary wealth in ancient times, the word for prosperity was waiwai (double water). In nature, the ancient Hawaiians found all the waiwai they needed. Ancient Hawaiian children grew up in a warm and affectionate world where people not related by blood were considered part of the 'ohana, or extended family. 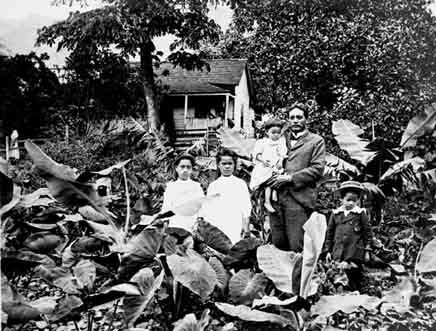 To Hawaiians, the family consisted not only of the usual blood relatives, but also those who were loved or who chose to participate in cooperative actions. The 'ohana is not unique to Hawai'i or to Polynesia. The extended family or clan structure is universal in human society, although it's more pronounced in agrarian societies before the emergence of individualism and market economies. 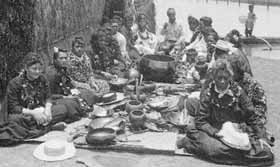 Hawaiians and Polynesians were very much aware of themselves as a member of the larger 'ohana. 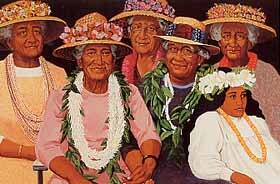 Seniority has for countless generations been a key factor in a person's status in Hawaiian society. Other residents of the youth-oriented United States can learn much from the Hawaiians about respecting and revering the wisdom of the elderly. This is also a central theme of SURFING FOR LIFE. The older surfers in the film are inspirational models of healthy, successful aging and of passionate involvement  both in life and in the ancient Hawaiian sport they love. They also embody the Hawaiian values of 'ohana and aloha. Hawaiians, in general, to their eternal credit, are still known as a people of a loving and generous nature. Hawaiian culture has left an important, humanizing legacy for the world, and SURFING FOR LIFE honors that contribution.